Questions will be researched, answered and posted to the Analog User Answer Forum. More than 99% of all questions received by Synhouse have already been asked and answered on this page, so you can get the quickest answer to your question by looking for the answer in the text below. The information you need is probably already on this page. product or synthesizer information you are looking for. Question 1: The MIDI control of my Original MIDIJACK-equipped analog synthesizer is great but the keyboard on my analog synthesizer doesn't work anymore. What's wrong? Answer: MIDI On mode has probably been selected. If the synthesizer is receiving MIDI, the Original MIDIJACK bypasses the local (built-in) analog keyboard. To turn MIDI off, hold the MIDI function button down for at least a half a second (>.5 seconds) and the MIDI will be off. In this MIDI Off mode, the built-in keyboard on the analog synthesizer will work, as well as all normal factory performance controls such as pitch bend, portamento, etc.. Since the Original MIDIJACK provides proper multiple note triggering and last note priority with a 4-note buffer, it is often best to use MIDI control even if playing live without a computer sequencer. Old analog synthesizers often have dirty electrical contacts in the keyboard, or even worse, completely rotten rubber and metal mechanisms, which causes missed notes or double-triggers. Use of such a primitive keyboard with a range of only a few octaves is pointless when the analog synthesizer is equipped with a Original MIDIJACK which has a 128-note range. Question 2: My analog synthesizer has a MIDIJACK but it won't receive MIDI. What's wrong? Answer: The MIDI may be connected or selected incorrectly. Make sure the MIDI output of the controlling computer sequencer or MIDI keyboard is connected to the MIDIJACK with a known good MIDI cable. Do not use the MIDI through function on any MIDI device, ever. Make sure the MIDI channel is correctly selected to be the same as the channel on the MIDI controller. Question 3: My analog synthesizer plays in tune with MIDI, but with the MIDI off, it no longer plays in tune. What's wrong? Answer: The old analog synthesizer needs calibration but the MIDIJACK may play it in tune perfectly due to it's infinite analog scaling. It should really be calibrated by a service center specializing in the repair of older analog equipment, but if it plays in tune with the MIDIJACK, you may be able to use it as it is with MIDI and never use the built-in keyboard at all. Question 4: My MIDIJACK-equipped analog synthesizer plays in tune with it's own built-in keyboard when the MIDI is turned off, but when the MIDI is turned on, it's out of tune. What's wrong? Answer: The MIDIJACK needs calibration to achieve proper intonation. This can be done by the Analog User with a keen sense of pitch. Read the chapter of the MIDIJACK Analog User Manual entitled "Analog Calibration Mode". Question 5: My analog synthesizer has a MIDIJACK and sometimes plays the wrong note or has a note stuck on after the music has stopped playing. What's wrong? Answer: The Original MIDIJACK is a MIDI interface for analog monosynths. These synthesizers have only one voice and should be sent monophonic MIDI notes only. This means that only one note at a time should be sent to a MIDIJACK-equipped analog synthesizer, and computer sequences should be recorded with this specific requirement in mind. Many previously recorded computer sequences contain chords instead of single notes. Since MIDI is a serial interface, these notes cannot be sent simultaneously. The notes will be sent one at a time in no particular order, as a string of note on commands without any note offs, while the monosynth is playing one note at a time. There is no way of knowing which note of the chord will sound at any one time. Making matters worse, the MIDIJACK puts all of these incoming notes into the 4-note buffer, then matches them up with note off commands when they start arriving. When the MIDI note on/note off data no longer makes sense, various active notes may linger in the buffer. When this occurs causing a stuck MIDI note, the user may push the MIDI function button to stop the stuck note. One considerable defect of the MIDI specification is that it supposedly has 16 channels, when it really has only one. Compared to multichannel audio mixing consoles and televisions, the MIDI spec has really misappropriated the word "channel". All MIDI data is sent on a single wire regardless of the "channel". One channel of MIDI data is sent on one wire. Sixteen "channels" are also sent on one wire, but at a greatly reduced speed due to the reduction of usable bandwidth. The result: All MIDI devices set up in a standard "star" configuration have to read and understand the MIDI data of all 15 irrelevant channels while set to only one "channel". Not only does this drastically reduce the bandwidth of the datastream, but it also increases the data processing chores required by all MIDI devices in the setup, in some cases by thousands of times. An audio signal processor set to receive a single a MIDI program change once during the middle of the song only (after doing nothing for two minutes), instead has to read 3,750,000 bits of data while waiting for the one command it will get during the song being played. The result may be poor, slow DSP (Digital Signal Processor) performance damaging the audio, and different results entirely when some MIDI tracks are muted, due to suddenly increased bandwidth of the datastream. If the MIDI setup is configured in the daisy chain configuration where the MIDI through function is used, the results are bound to be a hundred times worse due to added MIDI delays and distortion of the MIDI signal by pointlessly optoisolating the MIDI signal several times turning a sharp, clean digital string of zeros and ones into a sleepy analog sine wave that may be interpreted incorrectly and differently by the MIDI slave devices. In such a situation, synchronization between MIDI tracks is lost, and the feeling of the music wanders as it plays. To maximize performance in a MIDI setup with multiple instruments, the MIDI data should be channelized by any means available so that one instrument receives only the channel data sent on the channel to which it is assigned. It will still receive potentially unnecessary MIDI clocks and system exclusive data, but for now, this is as good as it gets. Question 6: I have an Original MIDIJACK installed in my Micromoog and it never plays in tune. The intonation of the keyboard is always bad. What's wrong? The Original MIDIJACK has a scale adjustment trimmer that affects the musical intonation of the analog synthesizer while it is under MIDI control. It is less than one inch away from the MIDI function button and may be adjusted by inserting a small flat blade screwdriver into the control panel opening. A Synhouse Pocket Screwdriver fits perfectly. The scale adjustment trimmer may be set by ear if the Analog User has a good sense of pitch. A MIDI controller keyboard should be connected with a MIDI cable to the MIDIJACK and the audio output of the Micromoog to a sound system for monitoring. The MIDIJACK should be in MIDI On Mode and set to the same MIDI channel as the MIDI controller keyboard. While playing alternating notes on the MIDI controller keyboard that are an octave apart, the user can turn the scale adjustment trimmer very slowly until the proper one-octave interval is heard and the entire keyboard plays in tune. It may be easiest to hear the tones clearly by adjusting the Micromoog so that the filter is open with the frequency set to maximum, the emphasis set to minimum, and the envelope generators set to sustain, without any vibrato on the oscillators. An extra help would be to use a MIDI synthesizer or sample playback keyboard as the MIDI controller and listen to its sound output as a reference tone to match the Micromoogs' intonation while adjustments are being made. A low note may be played on the MIDI keyboard while the Micromoogs' master tuning knob is adjusted to bring the two sound sources into tune. Next, play higher octave intervals of that note, and slowly turn the MIDIJACK scale adjustment trimmer until the entire keyboard plays in tune. For the Micromoog to work properly, the trimmer will have to be turned about 10% down, or counterclockwise, from the Synhouse factory 1v/octave setting. With this altered setting, the MIDIJACK should be putting out MIDI notes 0-127 at a scaling interval of .9v/octave. You can shrink or stretch your scaling from 0v/octave (not too musical) to approximately 1.2v/octave. Actually more than that, you could turn it all the way up to 2v/octave but the MIDI notes above 64 would be clipped and all the same pitch. The MIDIJACK is designed this way because most old synthesizers are out of calibration in one way or another and this is one way to try to bring them back into adjustment. Additionally, it allows the MIDIJACK to work in instruments that have exponential oscillators other than 1v/octave, such as EML (Electrocomp 101 and others) and EMS (Synthi AKS and VCS-3). Analog calibration should only be performed occasionally, as overuse of the scale adjustment trimmer may cause excessive wear and premature failure of the part. Question 7: I got a friend to hook me up with someone that's selling me his Moog Source for $600... so technically with the MIDIJACK I could get a Moog Source with MIDI $699? Question 8: Nifty small thing - that MIDIJACK. Will it be suitable for my Multimoog? Answer: Yes, the Original MIDIJACK. Question 9: Will the MIDIJACK work for my Korg 800 DV (I think it has no gate / CV or any input "holes" at all)? Answer: Yes, you can use the MIDIJACK II: Hertz so good! The lack of CV/gate jacks is no problem. The MIDIJACK II works with a lot of synths that don't have an analog interface, such as the Moog Prodigy documented on this site under Analog User Modifications. The Korg 800 DV is not listed on the list of known compatible synths for a technical reason: It is not a monosynth, strictly speaking. The DV stands for dual voice, which in those days probably meant something. Now, you would be more likely to stack the oscillators into a super-fat unison mode and you could use the MIDIJACK II to run it as a MIDI analog monosynth. If you really wanted two voices, you could use two MIDIJACK IIs and set them to separate channels and use it as a two-voice multitimbral analog synth. Question 10: I have a Roland MC-202. Is it possible midify it with your MIDIJACK? Question 11: Am I overlooking something, or does the MIDIJACK NOT support pitchbend or modulation functions? Answer: The MIDIJACK does not support pitch bend or modulation functions. Question 12: Someone told me that the MIDIJACK does not work with MS-10 and MS20. Is that true? Answer: No, it is not true. The Original MIDIJACK works with the Korg MS-10 and Korg MS-20, and the MS-50 as well. The MIDIJACK II is also compatible. They are also the only way to convert those synthesizers to MIDI for the price of a MIDIJACK. There is an installation article posted on this site under Analog User Modifications. Many things have been said in public and in private about the MIDIJACK that are not true. The listeners would do well to consider the motives of those who are making those statements about the MIDIJACK and refer all questions to the e-mail address at the top of this page. There is only one up-to-date and reliable source of information about MIDIJACK usage and compatibility: Synhouse. Question 13: I have a Korg Polysix. Will the MIDIJACK work for my synthesizer? Answer: The Original MIDIJACK is monophonic because it has been designed specifically for analog monosynths. The Korg Polysix is polyphonic. If it could be installed in a Korg Polysix, it would be impractical because you would only have one voice available. Question 14: If I purchase the MIDIJACK will I be able to install it in a Memorymoog? Answer: Yes, but you probably should not. The Original MIDIJACK is monophonic because it has been designed specifically for analog monosynths. The Memorymoog is polyphonic. If it could be installed in a Memorymoog, it would be impractical because you would only have one voice available. Question 15: Question for you....is it possible to put a MIDIJACK on a Roland TB-303? Or is the DIN plug that are on the stock 303s the same thing? Answer: Yes, the Original MIDIJACK works for the Roland TB-303 Bassline. No, Roland never put MIDI on a TB-303. The DIN jack it has is for Roland DIN sync, which does not play analog music at all, just sends a timing clock to the built-in digital sequencer. The MIDIJACK will allow you to use your MIDI computer sequencer (Cubase, etc..) or MIDI keyboard to play notes on the TB-303 over a much greater range than the TB-303 can do by itself. It converts the TB-303 into an analog MIDI monosynth. Question 16: Can I use the MIDIJACK to MIDI-up the Juno-60? Mine has DCB. Answer: No. There are two reasons. The primary reason is that the Roland Junos are digital synthesizers and Synhouse deals strictly in analog. The "D" in DCO stands for digital and the "D" in DCB also stands for digital. The secondary reason is that the Original MIDIJACK is monophonic because it has been designed specifically for analog monosynths. The Roland Junos are polyphonic digital synthesizers. You should be able to find a source for a Juno controller on the Synhouse Internet Links page. Question 17: I want to place a order, can you inform me about payments (I live in Europe). Answer: You can order securely online from the product pages and ordering page on this website and shipping is free worldwide. It is unfortunate that the European companies won't give you that. Question 18: A friend want to install a MIDIJACK in a Multimoog have you any plan to do it. Answer: Online, no, but there is no need for it. The synth is not very common and no more online articles are planned at this time. The installation method is a snap to do, and is absolutely identical to the Micromoog already on this site. The Original MIDIJACK comes with 3 manuals which describe installation in any compatible synth, including the Moog Multimoog, which is very easy to do. Question 19: I want to put MIDI on my ARP Odyssey (mk1). Is this possible? Answer: Yes, it is possible with the Original MIDIJACK. You must follow the instructions and locate the internal CV/gate points inside the synth and connect the color-coded MIDIJACK wires to those points. That synth never had CV/gate jacks, and it is pointless to drill a lot of holes to add an obsolete interface to a classic synth. Put a MIDIJACK on it! Question 20: Hello, I recently purchased a TB-303, without any mods. I'm interested in hooking it up to my PC so I can sequence using it using my software. Does the MIDIJACK work with the TB-303, and will it enable the PC sequencer to control all the features of the TB303? Answer: Nothing will control all the features of the TB-303 from a PC. The Original MIDIJACK will work for the TB-303. If you put it in the TB-303, it would become a MIDI analog monosynth with a 128-note range. If MIDI were turned off, it would operate as if unmodified until you turn the MIDI on again. It might not fit your needs. It is universal. There have not been any specific synth functions controlled by the Original MIDIJACK, because it is for over 100 different synthesizers, not just one. Minimoogs don't have accent, Odysseys don't have sequencers, and TB-303s don't have arpeggiators. What they all have in common is a combination of CV and gate control from their own keyboard/sequencer or external jacks. The Original MIDIJACK taps into that. It will not give it all the MIDI control Roland should have given it in 1983. Question 21: I'm searching for a MIDI interface for my TB-303. Is it possible to control the filter (cutoff range) of the TB-303 with the MIDIJACK interface? Can I use the sustain pedal controller to do this? I need an interface to control the filter via MIDI. Answer: See the answer to question number 20 above and see the Synhouse Internet Links page for a source of MIDI filter control. It will not be an internal MIDI retrofit as there is no such internal MIDI retrofit with filter control. Please note that no company could ever control the filter with a sustain pedal. The sustain pedal is for controlling sustain with a pedal, hence the name, and it is supported by the Original MIDIJACK. The filter cutoff frequency is a continuously variable control which the on/off action of the sustain pedal would not be suitable for. Question 22: I want to buy a MIDIJACK for my Yamaha CS-15 but it has 2 independent voices. Do I need two jacks? Or will one handle both voices? Answer: The MIDIJACK II is made especially for all Yamaha CS-series monosynths (except the Yamaha CS01 which claims to be analog but isn't, behind the panel that says VCO, it has a Digital Tone Generator instead of a Voltage-Controlled Oscillator) and some Korgs. The MIDIJACK II is monophonic. If you installed two of them you would have a multitimbral synth which would receive on two independently-selectable MIDI channels. At only 1" x 3" each, the MIDIJACK II units are very small, so you could fit two of them into a Yamaha CS15. It is wired behind the original CV input jack. If your synth has two of those, just put one MIDIJACK II behind each CV input jack. It can be self-installed with the 3 included manuals or factory-installed at Synhouse L.A.. Question 23: Just want to ask for the nearest dealer for Austria. Answer: Synhouse.com is everywhere. You can order securely online from the product pages and ordering page on this website and shipping is free worldwide. Question 24: I picked up my Moogs from the worst repair shop ever. He said they would install the MIDIJACK. He charged me for the d**n chasis punch...so I bought them their d**n tool...total was like $311. For absolute s**t. I had parts put in like new input jacks, I dont mind paying that..but the d**n labor at 35 an hour...he also didn't charge me for like 10 hours...but that's cause he blew 3 parts in the Prodigy, and had to figure it out. I am giving up on the repair shop. He got my Prodigy working again without the MIDIJACK, but when he hooked it back up it didn't work again. He unhooked the MIDIJACK and at least it worked this time (first time he had blown 3 integrated circuits). Now as for my Moog Source...the MIDI works. Answer: You should have sent them to Synhouse for Factory Installation. Question 25: I wonder if the MIDIJACK works with older, non-MIDI drum machines as well as analogue synths. I'd particularly like to know if it works with either the LinnDrum or Oberheim DX. Answer: The Original MIDIJACK is specifically for analog monosynths. It isn't meant to work with digital drum machines such as the LinnDrum or DX. There are no plans to develop a specific interface for either of those, mainly because there is very little interest in them and they already had very reasonably priced MIDI anyway. Question 26: Can I use a MIDIJACK for my Minimoog ? Question 27: Will the Original MIDIJACK work on a Roland Jupiter 4? Answer: The Original MIDIJACK will work fine for the Jupiter-4 but it will be monophonic because the MIDIJACK is designed specifically for analog monosynths. It has been installed it in the SH-1 and SH-101 and it is quite easy to do. Question 28: I've a Crumar DS2, with only gate in, out; I want to use it by MIDI, can I use your MIDIJACK? Answer: The Original MIDIJACK is designed for analog monosynths, and the Crumar DS-2 is not analog, the DCO is digital, not voltage-controlled, so it will not work for this synth. You could probably wire the CV wire to the VCF to sweep the filter with MIDI notes, and use the gate wire to trigger the gate, but not the main oscillator. Question 29: I own a Roland Juno-6 and would like to fit MIDI on it. Do you make any MIDI to DCB converter unit? Answer: Synhouse does not have anything for digital (DCO) synths or any polysynths, strictly analog monosynths. The Juno-6 doesn't have DCB anyway, and a converter will not help you. Question 30: Even if the Juno-6 hasn't got a DCB input, someone told me that it is possible to fit a DCB input connecting something to the Juno-6 and then using a DCB converter. Is this true? Answer: Yes, it is true but this type of modification is rarely done and will never be done by Synhouse because it is senseless. You can check the Synhouse links page to find a company that will put a DCB interface on your Juno-6, but it does not make any sense to spend $250 to put an obsolete interface on a synth then spend another $200+ to get a converter to convert MIDI to DCB. What would you do next, convert your PC and Macintosh to DCB? Besides, a Roland Juno-6 is only worth $200-300 in most countries. Question 31: Will the MIDIJACK work for my Yamaha CS10? Answer: The Yamaha CS10 will work with the MIDIJACK II. Question 32: I recently uncovered a small MIDI keyboard one Yamaha CBX-K1, I have had this knocking about for quite some time but now it is never used. I felt it would be good to have this as a handy CV/GATE keyboard. I am wondering whether the MIDIJACK could serve this purpose. In theory I just disconnect the MIDI out from the keyboard and wire this into the MIDIJACK input. Wire the MIDIJACK power supply in parallel with that supplying the keyboard. Install a few CV/Gate connectors and away I go. The keyboard itself runs on 9v DC or batteries. Any thoughts? Answer: Although this application has not been heard of so far, yes, it would work exactly as you described. The Original MIDIJACK requires at least +12v DC but less than +30v DC, regulated or unregulated is fine because the MIDIJACK regulates the power again. Question 33: I bought an Original MIDIJACK and read all 3 manuals that came with it. It lost me talking about the glide or portamento.....do I have to make another modification for the glide to work? If I just have the glide on at the desired setting on my synth, and play the notes on the MIDI keyboard...will I hear the glide? I really didn't understand the manual. Answer: That is good that you read the manuals and started asking questions before starting work on your synth. It depends which synthesizer you are using. On many synthesizers, the portamento is disabled and doesn't function while the synthesizer is under external CV/gate control. This has always been the case with many synthesizers, even though glide is generally thought to be an oscillator function, not a keyboard function. The portamento circuit is placed between the local keyboard voltage and the CV/gate input jacks, so when the jacks are used, the keyboard voltage is cut off and so is the portamento circuit. The portamento circuit needs to be rewired to function correctly. On most analog synthesizers of this type, the original circuit may be isolated and inserted where it belongs, between the CV/gate input jacks and the VCOs. The MIDIJACK connections are exactly the same as using external CV/gate control, so if the synthesizer has no glide while under CV/gate control, it won't with the MIDIJACK, either. The modification suggested here is not only a good solution for use with MIDI, it is a good and meaningful improvement to the instrument overall. Generating glide is so trivial that it may be slightly simpler to build a new exponential glide circuit. This can be done quite simply by taking an audio-taper potentiometer of at least 500K or 1 meg Ohms wired as a straight variable resistor (so the resistance goes up when turned clockwise) and connecting one end of it to the MIDIJACK #4 white wire (MIDIJACK CV output) and the other end to a 10 uF (or greater) capacitor which has the negative end to ground. The junction of the cap and pot should be connected to an op amp configured as a buffer-follower. This buffered output goes to the VCOs. This puts a lag generator between the MIDIJACK and the VCOs, and you need to find a place to mount the new knob you have created. If the op amp used is of the standard older variety like the ones used in the synthesizers themselves, the negative power pin should be connected to the negative supply in the synthesizer and not the ground. If this is not done, the op amp will be unable to reach ground, causing a tuning problem that will be accentuated when the MIDIJACK is MIDI transposing -36 for super deep bass, but the synthesizer octave select is set to 32'. A cross between these two methods that would preserve the original look of the instrument would be to use the original glide pot on the panel, rewired to the new glide circuit. Before any work is done, check the synthesizer portamento first. Some synthesizers, such as the Moog MG-1, Moog Rogue, and Roland SH-101 have the glide circuit correctly wired in the post-jack position already. Question 34: I have a Korg Triton MIDI workstation and two Moog synthesizers w/ Synhouse MIDIJACKs. I have 2 monophonic Moog riffs programmed into the Triton's sequencer. Since the MIDIJACK only has a MIDI in and not a through, how do I connect 2 Moogs to the Triton? Is there a splitter like an adapter from Radio Shack which will allow 2 MIDI outs from the Triton instead of 1? Answer: First of all, it is no mistake that Synhouse products do not have MIDI through. They don't now and they never will. It is purely intentional. Synhouse does not condone MIDI through. MIDI through on instruments is garbage. There were a number of foolish amateur functions outlined in the original MIDI specification. One such function was Omni mode. Quoting from the MIDI spec, "At power up or reset, all instruments default to Omni mode." In 1983, it probably seemed like a good idea to have every instrument play every MIDI note sent by every other instrument connected to the system. It allowed music store customers who knew nothing about MIDI to hear MIDI demonstrations from salesmen who knew even less about MIDI than they did. It guaranteed that they would hear sound even if they had no clue what a MIDI "channel" setting was or how to change it to match on a master and slave. Now in the year 2001 (when salesmen know about .2% more about MIDI than they did in 1983), it is frightening to think of a MIDI system that will play everything on everything all at once when you first power up for the day so that you have to go back and reset every MIDI channel and turn MIDI Omni mode off before you can play a single note sensibly. Another way the MIDI spec violates it's own sensibility is with MIDI through. If you look at the MIDI hardware spec and notice the single optoisolator at the MIDI input, you would think that someone would seriously criticize a new design which had 16 optoisolators at a single input, where each one is placed sequentially after the last. They would say that you can't do that, it can only have one optoisolator at the input. You could ask them why not 16 optoisolators all in a row? They would answer that optoisolators, like all optical devices, have uneven switching causing a rough output signal and it would badly distort the signal to pointlessly go though 16 of them before getting to the CPU of the MIDI slave. How hypocritical is this? That is exactly what happens when you go MIDI in, MIDI through, MIDI in, MIDI through........again and again to go through 16 of them, one for each channel! Maybe there is some subliminal message in the spec, and exception to the rule, that says only to use MIDI through three or four times in a row, unless you have a lot of controller data, or perhaps only two times if you would like your MIDI timing sync to remind you of the beat and feel you started with... A joke, really. For this reason, do not use MIDI through on an instrument, ever. To connect two MIDIJACK-equipped Moogs to a sequencer, you might first take a look at the jack panel of the sequencer. Does it only have one MIDI output? Sometimes a fancy sequencer workstation has 2 or 4 MIDI outputs. If not, 18 years later, it is time to finally step up to the plate and set up a proper high-performance MIDI system. At worst, you could start with a small MIDI through box and only connect all MIDI slaves to the output of that to ensure that each one receives the exact same signal, rather than differently delayed or distorted versions to each. For multiple MIDI slaves, you should use the best, a MIDI patcher (or MIDI patchbay). In the 80s, there were MIDI patchers from 360 Systems, Syncologic, KMX, JL Cooper, and more. Who knows why they don't have them anymore? Why don't they make Moog Sources anymore? These rack modules allow you to connect a lot of MIDI inputs and outputs and route them via the control panel, and storing complete MIDI setups in nonvolatile memory for recall later. The 360 Systems 8x8 MIDI Patcher is probably the best. Another one called a KMX MIDI Central is much fancier, but not as straightforward. A simple glance at the 360, even from 15 feet away onstage, will quickly tell you which input is connected to which output. For best results, you should use one of these, they can now be purchased used very cheaply. If you cannot do that and don't ever think you'll need 8 or 16 outs, use a MIDI through box from Roland or whatever. They typically have one MIDI in and four MIDI outs. They will work, but are not not rack-mounted, etc. You can do it now or you can do it later, but it is mandatory. A MIDI splitter cable is not possible because MIDI is a data stream going through a current loop and is very different from an audio or CV signal which could be split in many cases. Question 35: Don't I just set a MIDIJACK-ed Moog to receive the track on a particular MIDI channel and set the MIDI sequencer to send on that same particular channel? Answer: Exactly. It is simple that way. Up to 16 MIDIJACKs can be used in this manner. Question 36: The MIDIJACK sounds great. My plan would be to house the unit in a stand alone box for use on various synths. Is this possible? Answer: Sure, it would be possible, but it would defeat much of the purpose of having it (convenience and selectability). It would work that way. The warranty does not cover unintended usage. Synhouse has used several of those for early beta testing. For daily usage, it is a lot of hassle to patch it up each time. For studio use, okay, but for live, not a good idea. The MIDIJACK was specifically designed for internal installation and has many totally unique features that enable it to do what nothing else can do. If it were intended for standalone usage, it would have been designed much differently. In the reverse, an old MIDI control box (such as a Roland MPU-101) cannot be removed from the original factory enclosure and installed as a MIDIJACK can. Question 37: Can I use a MIDIJACK to hook up to my KORG X-911 guitar synth's CV input? Answer: Yes, you can use the MIDIJACK II. It should be connected inside the X-911, behind the jacks, so you can still use the CV/GATE jacks when you need to just by turning the MIDI off. Question 38: Hello. I found your site via a post to one of the synth groups I read online. Your MIDIJACK looks very nice (and affordable). Is there any chance you have or are considering releasing a version with Hz/v scaling to accomodate these types of synths? A good deal of what I have is Hz/v and that would make these devices a little more enticing. Answer: The MIDIJACK II: Hertz so good! was released 2/1/2001 and it is specifically intended for Hz/v analog monosynths. Question 39: My keyboard is a Korg MS-10. Your site says the Korg MS-10/20/50 can use both the Original MIDIJACK and the MIDIJACK II: Hertz so good! How is this possible and which one should I choose for my own MS-10? Answer: The Original MIDIJACK has a volt/octave output and the MIDIJACK II has a Hz/volt output. The Korg MS-series are primarily Hz/v synths, but they are unique in that they also have an adjustable volt/octave input as well (labeled TOTAL or OCT/VOLT) so you have a choice as to which one you'd like to use. If you use the Original MIDIJACK, you will have the full MIDI 128-note range and the MIDI transpose select mode, but you have to work within the limitations of the Korg's built-in linear-to-exponential converter. This Korg circuit may take several minutes to warm up to the temperature where it can be tuned and the knob is extremely sensitive. Once tuned, it may drift over time as most volt/octave synths do. This may be fine for studio use. If you use the MIDIJACK II, you will then have a shorter MIDI note range and no MIDI transpose select mode, but there will be several advantages which may appeal to some users. 1) The tuning will be rock solid as Hz/volt synths always are. 2) There will be no warm-up time. It will be ready to go when it is first turned on. 3) Even the shorter MIDI note range is a lot more than the Korg synths ever had without the MIDIJACK and most users will find them to have the lowest bass lows and highs as high as they need. 4) The installation is equally easy with either MIDIJACK type, but the MIDIJACK II will go behind the Hz/v VCO inputs and thus free up the v/octave inputs for external modulation or other uses. All MIDIJACKs work very well. Question 40: I have a Korg MiniKorg II (also called the 700s). It does not have CV out ports on the case. Do I need a CV converter first before installing the MIDIJACK? Answer: No, not at all. It will work with the MIDIJACK II: Hertz so good! There is no point in putting an obsolete interface on a synth. Just solder the MIDIJACK II wires to the CV and gate points inside the synth. If you are uncomfortable doing the work based upon the three manuals it comes with, you can send the synth to Synhouse L.A. and have the labor done at the prevailing rates, and you pay round trip UPS costs. Question 41: Can I use a MIDIJACK for my Roland GR-700 guitar synth? It has MIDI but no MIDI input. Answer: No. It isn't analog, it's digital. Question 42: Hi, my synth is a Micromoog. The synthesizer is in good working order, and the Synhouse MIDIJACK looks like a cost effective way for doing this but they say the Micromoog is the most difficult to mod. Answer: No, actually, it does not say that. It says, "Beginners beware, the conversion of a Micromoog to a MIDI sound module is one of the most difficult MIDIJACK installations of all." What this really means is that taking any keyboard synthesizer and chopping off the keyboard and transforming it into a sound module is far and away more difficult than installing the MIDIJACK in any synth. MIDIJACK installation is easy no matter what the application is. If a Micromoog were already chopped and reconfigured into a CV/gate sound module, it would actually be easier to put a MIDIJACK on it than any other synth. The MIDIJACK has eight wires to connect, but with there being no keyboard to bypass, you would only need to solder four of them (+ power, ground, CV out, s-trig out) and leave the others unused. Question 43: Has anyone tried this Moog Micromoog Module conversion? Answer: Yes, the modification was performed by Synhouse and the article was written. The most difficult thing was fixing a very broken Micromoog with a dead VCO, the second most difficult thing was cutting it down and reconfiguring it as a sound module. The addition of the Original MIDIJACK was easy. When it was done, it was cool-looking, sitting upright like a tiny modular synth. Question 44: Okay, let's say to make things easier I only want to install the MIDIJACK without converting the Micromoog into a module. This would only require me to solder four wires? Do I need to do anything else like add a new resistor? Answer: Yes, only four wires to solder and no resistors needed. Will the glide function still work under MIDI control? Question 45: If it only takes soldering four wires I think I'm interested in buying a MIDIJACK for my Micromoog, please quote me the price plus shipping. I don't have a credit card so can I pay with a check or money order? Answer: Yes, you can pay with a check or money order. The total is only the price of the MIDIJACK because shipping is free worldwide. Question 46: Would CV/ S-Trigger jacks still work after installing the MIDIJACK? I may purchase an analog sequencer sometime in the near future. 1) There is no store that sells cables which fit those funny, odd jacks. Even Moog dealers never stocked those. 2) The Micromoog is known not to live up to its' stated 1v/octave sensitivity. It is greater, maybe .9v/octave. Connect a Micromoog to a Minimoog or ARP Odyssey and you will quickly see that they will not track each other. Some modifications can be performed to correct it. Ask around on the synth DIY lists and you will find out about it. MIDIJACK users don't need that modification. See question 6 asked and answered above. Question 47: I still haven't decided if I really want to buy the Original MIDIJACK for my Micromoog. I'm also looking into other options such as MIDI converters that would run around the same price range. Answer: There are none from any reputable real companies for the price of a Synhouse MIDIJACK, unless you can find a used one. Figure out the cost of a power supply and cables, two things that are not needed with the MIDIJACK, you're going to need those, too, and also add in the cost of shipping those items. While you are at it, add up the cost of shipping "MIDI converters" because, unlike the MIDIJACK, they don't have free shipping worldwide. Question 48: Well, the jury is still out on the idea of spending money on a Synhouse MIDIJACK for my Micromoog because I want to be able to control modulation rate and note data via MIDI. Is there anything else I should know? Answer: Quite a few things really, but most of them are well beyond the scope of this Analog User Answer Forum... You cannot use MIDI to control the modulation rate of your Micromoog with any product available from any company. Question 49: Well, I still need MIDI for my Micromoog, but ****** (another company) claims to be able to control the glide and modulation on the Micromoog with their MIDI converter and no installation is required. What about that? Answer: Please note that the Micromoog has a very good and special glide circuit and LFO circuit, and there is no other device available from any other company anywhere to control them as an internal retrofit. You also cannot control those circuits via some external box because these circuits are not externally voltage-controllable on a Micromoog (or any other synth known to Synhouse). Look at the back panel of your Micromoog and please notice that there are no jacks labeled GLIDE RATE VOLTAGE IN or LFO RATE VOLTAGE IN. The Micromoog/Multimoog are differentiated from the rest (Rogue/Minimoog/Source) by a very unique and flexible modulation section with rate, source, and routing controls. This has many sources such as ribbon controller and LFO generating controllers that can be routed to many destinations such as VCF and VCO. Nothing can do any of this externally. Nothing can affect the routing selection, the sources, or the destinations, as this would require a complete rewiring of each section of the synth. Question 50: This is a problem for the MIDIJACK, but maybe I can still find some way to use MIDI to trigger the modulation input on the back of the Micromoog. Answer: That is a problem that will continue throughout all time because the Micromoog LFO rate cannot be externally voltage-controlled. See above question 49 but consider the following: A lot of these devices from other companies do have computer/digital/software-generated LFOs and glide which can simulate those functions into their own voltages and then go into the VCO and VCF jacks on synths, then those software-based functions can be controlled via MIDI, if you have some way of remotely generating those MIDI commands. Do you have a MIDI keyboard that will send a MIDI LFO rate change command and a portamento rate change command? Probably not. If you did, then you would be able to do LFO/glide functions and remotely control them through MIDI, but they will no longer be analog, and they will no longer be your Micromoog with its' special modulation routing section and glide circuits, you will simply turn the Micromoog glide off and the Micromoog LFO off. Some users are satisfied with these software-simulated functions, but some prefer real analog glide and modulation routing. You should ask some experienced synth collectors or techs to refer you to a brand of synth controller that will compensate for the .9v/octave problem that the Micromoog has, to explain to you which functions can be externally controlled and which can not, and to provide you with all the custom-made cables you will need. The best thing to do would be to learn more about your own needs and buy one of the top-of-the-line MIDI converters which will control your Micromoog and any other synth as well (Korg, Yamaha) all at once. They cost between $600-1,000, but are well worth the cost if you are serious and demand the ultimate in flexibility. Question 51: Now I guess I'd still have the problem of not being able to control modulation rate via MIDI. Maybe it's best to leave the Micromoog as it is and control it with a MIDI controller, that way if something happens to it I can always sell it for parts and buy something like a Multimoog. Question 52: Are the questions on the Synhouse FAQs page real? Question 53: I have a Korg MS-20 and a Micromoog. Will they work with your MIDIJACK? Answer: They both have been tested and work with the Original MIDIJACK. Additionally, the MS-20 may be used with the MIDIJACK II: Hertz so good! Question 54: I was informed the you do in house installations. Is this true? Answer: Yes. This service is available now, with details and pricing on the Factory Installation page. Question 55: Will I lose any function of my analog synths when converted to MIDI with the MIDIJACK? Answer: No, you don't lose anything. When the MIDI is turned off by pressing the button for a half a second or more, the Original MIDIJACK bypasses itself. At that time it acts as if it never had MIDI at all. When it is activated, it gets note control on the selected MIDI channel, and the fastest MIDI response available anywhere. Please read the functions listed on the web page of the particular MIDIJACK model that concerns you and note that it is a complete listing and does not have any other functions not listed. Question 56: I think I read that you lose function of the mod wheel after installing a MIDIJACK. Is that correct? Question 57: One quick question: Is it my assumption the MIDIJACK uses the standard one volt per octave scaling? Answer: The MIDIJACK II: Hertz so good! is Hz/volt. The Original MIDIJACK is shipped from the factory calibrated to exactly 1 volt per octave. When you pull it out of the wrapper it will give you 3.00v for MIDI note 36, 4.00v for 48, 5.00v for 60, 6.00v for 72, 7.00v for 84, 8.00v for 96, 9.00v for 108, 10.00v for 120, on up to 10.58v for the highest known MIDI note 127. For an easy test, the MIDIJACK has the automatic user calibration mode enabled on power-up, so it puts out the highest note 127 until you send it MIDI or press the button. The gate is off at this time so it will remain silent. You can check the voltage to see it is 10.58v and adjust it if it isn't. The problem is that most analogs are out-of-whack now, just as they were the day they were new. The truth? People didn't use CV/gate control in the 70's, either. The Micromoog sold thousands and no one ever noticed it was factory set to .9v/octave and non-adjustable. Most older MIDI controllers cannot compensate for that, but with the MIDIJACK, no problem, just turn down the scale adjust trimmer. Question 58: How much can you vary the output of the Original MIDIJACK with the scale adjust trimmer? Answer: A lot! You can turn it way down to around .25v/octave to control an EMS Synthi or VCS-3 Putney, or way up to 1.2v/octave for an EML synth such as the Electrocomp 101. This is a good design because most kids are using beat-up analogs that are out of calibration, and won't pay to get them calibrated either, not once, and not repeatedly as often as they need to be serviced. You can just twist the MIDIJACK trimmer and tune it right up. Also note that the keyboard and CV inputs are totally different circuits. ARPs and Moogs and everything else were tuned to their keyboards (a massive string of matched resistors between key switches) and not to the CV inputs. Companies like Switchcraft must have sold them millions of $$$ worth of jacks that were used in manufacturing but never plugged into anyway. Players like Gary Wright used CV/gate and remote keyboards, but their gear was always modified and totally custom and therefore they never needed the jacks to start with. Question 59: I'm interested in the MIDIJACK, though my inquiry is about the compatibility of it with Yamaha CS series analog synths. Specifically the CS5 monosynth. Will it work with this one? Answer: Yes, it will work with the MIDIJACK II: Hertz so good! Question 60: I would like to MIDIfy my Synthi AKS. It has been my dream for many years. How do I install the MIDIJACK in this rather esoteric hybrid analogue/computer controlled beast? Answer: Just buy the Original MIDIJACK, follow the instructions in the three included manuals, and turn the scale adjust trimmer down. Question 61: As soon as your product supports the Odyssey, I'll buy it. Answer: Too late. The Original MIDIJACK already supports the Odyssey, and it has since July 2000. Question 62: I am the proud owner of a whitefaced ARP Odyssey and I'm considering to give it MIDI. However, since it's the earliest version of the Odyssey, and therefore very desireable of course, it has no CV-Gate interface at all. So I would like to know if it is possible to build the MIDIJACK into my ARP without having to modify it with CV-Gate-Trigger inputs first? I'm not really a tech, guess you've figured that out right away, but I think I could manage. I would need some good instructions though. Well, I just hope, that I don't need to do a mod first to mod my Odyssey. I guess you can understand that. Answer: The Original MIDIJACK is definitely compatible. It does not need to have CV/gate jacks, although it would be easier if it did, just because it would be so easy as to not require any thinking at all. You just need to locate the point in the synth where the keyboard voltage goes to the VCOs, and break that point in the circuit and insert the blue and white wires of the MIDIJACK, then find the point where the keyboard gate signal goes into the envelope generator, break that and insert the yellow and green wires of the MIDIJACK. There are three manuals included which explain all theory and applications for any compatible synth. It would be best not to add CV/gate jacks because it would be foolish to drill several holes in the synth and spend all that time and money to add an obsolete interface. Put a MIDIJACK on it and it will still look clean and nearly original. Question 63: I would like to know about the availability of the MIDIJACK in The Netherlands. Where do I buy it? Answer: If you are reading this for the first time, you are already here. The Synhouse MIDIJACK is available worldwide. You can order securely online in one minute on the ordering page of this website. Shipping is free worldwide. They arrive in approximately 2-14 days, depending on where in the world they are headed. Quite simple, this. Question 64: Do you have instructions on connecting your MIDIJACK to an EML 101? 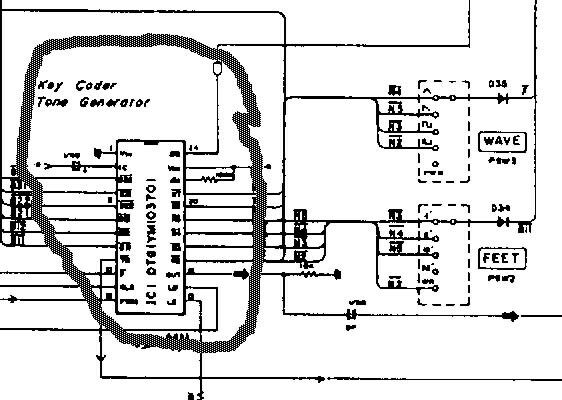 Does it control all 4 VCO's or just VCO 1? I read about the scaling for the Micromoog and the suggestion that exponential oscillators like the EML and I suppose Paia are suppose to work. Aren't they Hz/Oct instead of V/Oct? So how does it work with Paia oscillators or EML? "The Original MIDIJACK works in synthesizers where others don't, such as in the EMS Synthi and VCS-3 Putney, the EML Electrocomp 101, and in the improperly calibrated Moog Micromoog. This is due to the nearly infinite analog scaling capability of the MIDIJACK. It is fully adjustable so that any analog synthesizer with exponential VCOs can be controlled, whether it is 1 volt per octave, .9 volt per octave, .32 volt per octave, or 1.2 volts per octave. It is simply a matter of turning the scale adjustment trimmer up or down. An EMS Synthi or VCS-3 Putney has an oscillator sensitivity much greater than 1v/octave, much more like .25v/octave or .33v/octave. This can be tuned-in perfectly with a MIDIJACK by turning the trimmer counterclockwise. The Micromoog is known to deviate from the 1v/octave sensitivity the factory claimed for it, being something more like .9v/octave. This is no problem for the MIDIJACK, as the trimmer can be turned counterclockwise until the proper intonation is found. This Micromoog application is described in great detail in response to a question posed by a MIDIJACK owner posted on the Synhouse website under Analog User FAQ's. The EML Electrocomp 101 is known to have a VCO sensitivity of about 1.2v/octave. A way to configure a MIDIJACK for this application is to turn the scale adjust trimmer all the way clockwise, then set the MIDI transpose select mode to transpose down two octaves (-24 half steps) as described in the MIDIJACK Analog User manual. The trimmer should then be turned slightly counterclockwise until the correct intonation is found." The Original MIDIJACK is designed specifically for analog monosynths so it controls as many VCOs as the output voltage is routed to, monophonically. The 1970s-era Paia oscillators are linear Hz/v, they are not exponential. They would require the MIDIJACK II. Question 65: Very interested in installing a MIDIJACK in my Korg Mono/Poly. Is this an acceptable synth to put it in? I would be in heaven if it worked!!!!! Answer: The Original MIDIJACK does work with the Korg Mono/Poly. It is a v/octave synth because it uses American SSM synth chips. Question 66: Can you tell me the power requirements of your MIDIJACK unit and its current draw? Answer: The Original MIDIJACK comes with three manuals which provide all the information needed to install it in any compatible synthesizer. Quoting from one of them, "For power, the MIDIJACK requires a regulated or unregulated voltage of at least 12 volts DC but less than 30 volts DC, and any analog synthesizer has such a voltage available for use. The MIDIJACK current consumption is very low, approximately 30 mA." Question 67: Can the MIDIJACK be battery powered by strapping two 9 volt batteries together? This would allow it to be in a small box. I have a Serge modular but am not sure I have room in the box. Answer: Yes, if they are connected in series. Two 9v batteries in series would be a little over 18vdc, and it would work perfectly. Even better and cheaper in the long run would be to use one of those small rectangular battery clips that hold 8 "AA" cells. Question 68: I have Casio CTK-550 with headphone/outlet and sustain. So the question is: Can I connect this CTK-550 with PC sound card (MIDI connector)? I can hear and record MIDI files from the net. Answer: The question is not entirely clear. Maybe it would help to state a few fast Original MIDIJACK facts: The MIDIJACK is for MIDI input only. It can be controlled by any MIDI device, including your PC sound card. The MIDIJACK then puts out voltages to control an old analog monosynth (ARP, Roland, Moog, Oberheim, etc...). Casio never made an analog synth. With a MIDIJACK and a real analog synth you can play MIDI song files from the internet. I have used another brand of MIDI controller for 1 MiniKorg 700s and 1 Korg 770 and that worked fine. This is a rather expensive solution and it would be fine to find a more inexpensive way to get MIDI control. I have schematics for all synths and I think I would be able to fit your MIDIJACK into them and also make step-by-step instructions for others to come. I could provide you with easy-to-follow step-by-step instructions and you could provide me with MIDIJACKs to use. Is it possible to make a deal here? Question 70: Hello, I have a Micromoog and I am considering purchasing a MIDIJACK to control it. I do not want to destroy the synth as per the modification article featured on your site. Is it possible to install the MIDIJACK into this synth while still retaining the normal functions of the ribbon controller, mod wheel, and keyboard when in non-MIDI mode? Answer: The Original MIDIJACK includes free shipping worldwide and three manuals which provide all the information necessary to install it in any compatible synthesizer. The articles on the website are just notes from installations actually done by Synhouse and are only about .01% of the total possibilities. If you followed the article and just remembered not to saw off the keyboard, you'd be fine, and MIDI would be defeatable with the button, returning the Micromoog to normal non-MIDI use. Question 71: Will the Original MIDIJACK work for my Kawai SX-210? Answer: The Original MIDIJACK is specifically designed for monophonic analog synths and will not work for your synth because the Kawai SX-210 is neither monophonic nor analog. Question 72: Can I use the Original MIDIJACK on my Crumar Stratus? It is not monophonic. Answer: The Original MIDIJACK probably will not work for you, although nothing is really known about the Stratus because Synhouse has not researched the compatibility. The Original MIDIJACK is designed specifically to add MIDI to real voltage-controlled analog monosynths. Fake polyphonic synths (like the ARP Omni, String Ensemble, Roland Saturn, Moog Opus 3, Polymoog) will not work because they are polyphonic and the Original MIDIJACK is monophonic and they also are not really voltage-controlled analog, but rather more like a home organ. Your Stratus may be of this type. Another type of synth would be the real analog oscillator polyphonic synth like the Prophet-5, OBX-A, or Memorymoog, which can use the Original MIDIJACK, but it would be pointless as it would only control one voice. Question 73: Hello, is it possible to midify a Roland TR-606 with your Original MIDIJACK? Will the velocity of the drumtones be adjustable via MIDI or will all the tones have the same velocity? Answer: No. The Original MIDIJACK is specially designed for analog monosynths. As for what you are looking for, there is no such internal MIDI retrofit available from any company in the world. The TR-606 is not MIDI and it does not have velocity without MIDI anyway. The only brand of analog MIDI retrofit small enough to fit inside a TB-303, MC-202, or TR-606 is Synhouse, but it is not intended for drum machines. Question 74: Will the Original MIDIJACK work with a Roland SH-101? Answer: Yes, it works very well. Question 75: I'd like to install an Original MIDIJACK into my Elka Synthex first edition. Is this possible? Answer: The Original MIDIJACK is specifically designed for monophonic analog synths and will not work for your synth because the Elka Synthex is neither monophonic nor analog. Question 76: Hello! I've got one query: Will the MIDIJACK work with the Minimoog? If so, will it have fitting guide included? How about ARP Odyssey? Will it go well with Hz/v synths? MS-20 in particular. Answer: The Original MIDIJACK will work with the Minimoog, Odyssey, and MS-20, and the MIDIJACK II will work with the MS-20 and all other Hz/v synths. Full installation instructions are included. Question 77: Hello. I'd like to order a MIDIJACK. From the website it looks as if it can be installed in a MG-1 synth. How about Moog Sonic Six or Minimoog? Answer: Yes, the Original MIDIJACK it will work with the Minimoog and Sonic Six. It will work with the Sonic 2 and Sonic 5 as well. Question 78: I would like to install your MIDIJACK in my Oberheim Two-Voice. Trouble is, I don't find the Two-Voice among the synths you provide installation instructions for on your Analog User Modifications page. Do you know whether the MIDIJACK can be installed in the Two-Voice so that the user can drive both SEM modules from either the keyboard or MIDI? 1) Will it control only one SEM? 2) If so, which one? 3) If not, are you willing to tie both SEMs together to play in unison? You kind of tie up some of your Two-Voice options here. One user chose not to read the instructions but spent much time trying to get it into an application for which it was not intended, and wanted to use a mechanical DPDT switch to select local analog keyboard or MIDI control. The MIDIJACK already does that automatically and anyone who has read the instructions knows that. That whole bypass selection process is one of the KEY functions and design advantages of the MIDIJACK, which has that built-in and is software-controlled. This saves the (often-inexperienced) user from having to cut six wires, strip six wires, solder six wires, check six wires for shorts (any one of which could ruin the synth and/or MIDIJACK), drill the holes for the switch, bolt it down, and have some non-factory-looking toggle switch sticking out of the panel. Sure, some other companies would give their customers a surplus switch, ten feet of wire, and wish them well with the hours of extra handiwork building what should have already been company designed and factory built, but Synhouse preferred to spend the time and money to do it under software control and save each user an hour or two and make a cleaner installation that looks nearly factory on most synths. Your particular application actually could use a mechanical DPDT switch, but in a very different way. An application that would require a mechanical switch is one where you need to manually control the signal switching without interfering with the MIDI notes by turning the MIDI off. This would be something like a Two-Voice where you have one MIDIJACK and you set up a different sound patch on each SEM and switch the MIDI control from one to the other on the fly. Additionally, two Original MIDIJACKs could be installed to make the Two-Voice into a multitimbral MIDI analog synth. Question 79: I have a question concerning the MIDIJACK interface. I'm thinking of installing MIDI on my Yamaha CS15, Korg MS-20, and Mono/Poly. Does your MIDI kit work for those synthesizers? Answer: Yes. Actually, it is not a kit with parts and a circuit board. It is fully assembled and tested and the wires are prepped and ready to connect. The Original MIDIJACK will work for the Korg Mono/Poly and the Korg MS-20, and the MIDIJACK II: Hertz so good! will work for the Korg MS-20 and Yamaha CS15. Question 80: I just purchased a Paia 4700 modular synth and need to retrofit it to be compatible with MIDI. Its' triggering method differs from most analog synths in that it is not control voltage controlled. Instead it uses linear-response (V/Hz) the same as the Korg MS synths. I am curious as to whether the MIDIJACK would be compatible with my synth. Answer: Your question itself is a little incorrect. The Paia 4700 is a voltage-controlled synth. It does have linear VCOs that require an exponential type of input (such as provided by the MIDIJACK II: Hertz so good!). The Korg MS-series is not limited to strictly Hz/volt, either. The MS-10/20/50 can accept either a volt/octave or Hz/volt control voltage (so they can use either the Original MIDIJACK or the MIDIJACK II). For a Paia 4700, you would use a MIDIJACK II: Hertz so good! Question 81: I would like to know if the MIDIJACK is compatible with a Korg MS-20. If it is, how much is shipping to Perú? Answer: You can use either the Original MIDIJACK or the MIDIJACK II with the Korg MS-20. Shipping to Perú is free. Question 82: I have a Realistic MG-1 and am very interested in a MIDI mod. How much do you sell the Original MIDIJACK product for? I also have a Rhodes VK 1000 which is 77 key. Will all of the keys work on the MG-1 after the mod? Answer: Current pricing for the Original MIDIJACK is on the ordering page. Shipping is free worldwide. Pricing for Synhouse Factory Installations are on the Factory Installation page. The keys on the MG-1 will still work when the MIDI is off and it will receive all 128 MIDI notes when the MIDI is on. Question 83: Hello, I was wondering if the MIDIJACK is compatable with the Korg MS-20? If so, please let me know, because I'm debating on selling it, but if I could MIDI it up for the price of a MIDIJACK, I'd definitely hold onto it! Answer: Yes, the MS-20 will work with either the Original MIDIJACK or the MIDIJACK II: Hertz so good! Please see the answer to question 39 above. Question 84: I have a Roland MC-202 at my home, and maybe I want to midify it, it's possible with your MIDIJACK system? Answer: Yes, it works with the Original MIDIJACK. Question 85: I bought an Original MIDIJACK for my Roland TB-303 and I'd like to know once this piece is installed what sort of control do I have over the 303 I'm going to install it to? Tempo? Notes? Tracks? Patterns? Etc? What can I do with the chip that I couldn't already do with the 303? One question before I continue will the 303 sync to the keyboard after it is all connected? Can you send me a list of e-mails of people who have installed the chip into the 303 and playing with it now? The reason I ordered the piece is to sync the 303 to my keyboard (Korg Triton), I have been using the 303 in many of my tracks, but all the cannot be recorded unless I get a way to sync the 303 with the rest of the performance. I tried numerous times in getting the Roland Sync Box SBX-80 but never succeeded. I found your site and I thought, my search is over. The simplest piece of equipment to do the job. I wanted to send it Devil Fish but I never came around the money to do so. My question is can I control the tempo of the 303 from my keyboard? If I cannot sync the 303 with my keyboard with your device I'm sorry but I will have to return it. The SBX-80 will sync a 303 to other things and so will the cheaper SBX-10. An SBX-80 will not tell your 303 what notes to play. An SBX-10 will not tell your 303 what notes to play. Any similar sync device will not tell your 303 what notes to play. None of these devices make your 303 into a MIDI instrument you can play from your fingers on a keyboard or from a MIDI sequencer. Devilfish won't do this, either, having neither MIDI notes nor MIDI sync ability. The Original MIDIJACK will not perform those functions and it is not meant to. A lot of things will do those functions but not what the Original MIDIJACK does. What the MIDIJACK does cannot be duplicated by an SBX-80. The MIDIJACK converts the analog synth voice inside a 303 (or a hundred other synths) to MIDI. You can play it from a keyboard. When you say keyboard, you probably mean something else. You cannot sync a MIDI keyboard to anything because you play it with your fingers and your fingers cannot be synced. If this Korg is some kind of workstation that has a sophisticated sequencer, you can use that to sequence your MIDI synths, because it tells them what notes to play through MIDI, which is the main purpose of MIDI. Your Korg or PC sequencer can tell the MIDIJACK-equipped 303 what notes to play, a lot of them, over a range of ten octaves. The reason why someone uses a new sequencer like this with an old analog synth through the Original MIDIJACK is to use the extensive editing (tempo, transpose, rearranging, mute tracks, etc) and storage features that they have with MIDI today, along with a million times as much song storage. You can store your songs on disk. Question 86: Why don't you sell the MIDIJACK as a kit? That's what I want, a kit version, because I know how to solder and I'd like to save some money. Answer: This question comes often. Can a question be best answered with a question? Why doesn't Sony sell their DVD players as kits? Why doesn't HP sell their printers as kits? Why doesn't Casio sell their watches as kits? Because they are machine-manufactured on a robotic assembly line with carefully controlled processes. The temperatures, humidity levels, and cleanliness are critical. The MIDIJACK is just the same. It couldn't be soldered together at home by a musician no matter how often people dream that it could be. The high-speed data circuitry requires a board that is cleaner than one could make at home. It has unbeatable combination of price, performance, and convenience that could not be duplicated by a kit from this company or any other company. It would actually cost more to sell it as a kit due to the high-volume custom surface-mount componentry used. It is assembled by robots and no person touches any of the resistors, capacitors, or integrated circuits at any time before, during, or after the multistage soldering processes. They have not even been viewed by the human eye prior to final inspection. A bigger issue is wasting tech support troubleshooting nearly a thousand user-assembled kits each year. How much would that cost? Sure, the MIDIJACK could be redesigned to use different components and be four times the size to enable hand-soldering, but why? Question 87: I came across the Original MIDIJACK and would like to try it on my Pro-One here, I live in Holland, do you have distribution here? Answer: You can order it securely online and it will be shipped to Holland for free. You will get it in a few days. Question 88: I am having a problem with the Original MIDIJACK in my Moog MG-1. When I adjusted the trimmer on the MIDIJACK board, so the MG-1 would play a complete scale I forgot to check if it was in tune with anything else. I'm realizing now that when I tune the low C to actual C, via the MIDIJACK, the keyboard doesn't run through the scale, basically right about E it starts to go off scale and by the time I get to the next C it's totally off. I've checked the tuning pot on the MG-1 and that's not the problem, so I'm wondering what it might be. Any suggestions? Answer: Yes, set the Original MIDIJACK scale adjust trimmer back to the way it was when you received it from Synhouse, which is in tune. You never tune the MIDIJACK, you adjust the scaling, which means that turning the trimmer up stretches the tuning between the keys, the intonation, not the tuning. The MIDIJACK tuning is always the same, where MIDI note #0 is a very accurate 0 volts. When set to around 10.58v during calibration mode (a software-simulated MIDI note 127), you are at exactly one volt per octave, and MIDI note #12 is 1v, #24 is 2v, #36 is 3v, and so forth. If you are using something which claims to be 1v per octave but is actually not, like a Micromoog, it will want to get about .9v per octave, and this is no problem for the MIDIJACK. You turn it down and would get 0v, .9v, 1.8v, 2.7v, and so forth. Systems which try to do this in software really fall apart here in their resolution, because analog is infinite. You TUNE to another reference with your master tuning control on your synth. Match a low one by synth tuning , then trim the MIDIJACK scaling so the high notes also are in tune. MIDI was created primarily for popular music which is based on C. The MIDI note range starts with a C and goes up many octaves. To provide the full range of MIDI notes for analog synths starting with 0v, zero volts is MIDI note #0, a C note. The Moog MG-1 plays F on 0v. It plays F an octave up at 1v, and so on. You should transpose the MIDI controller to account for this. The MIDIJACK has more than five octaves available, in fact over ten. This was done because MIDI has 128 notes, and MIDI note #0 is a C, and one of them has to be 0v, then the top is 10.58v. Some people say we should have made it already transposed to F because Moogs are like this, and the Moogs are the most popular. Well, the Source is a Moog, isn't it? It plays C from 0v. So does the Pro-One. And the SEM. And the Prophet-5. And the SH-1. And the ARP Odyssey, SH-101, etc..... Even an antique non-velocity MIDI keyboard like Juno-106 can transpose any number of steps. You will most likely want to set it to -5 steps (semitones). Question 89: Does the Synhouse MIDIJACK provide MIDI out as well so I can use my Pro-One as a MIDI master controller? Answer: No, fortunately. A Pro-One? You couldn't find a worse master controller keyboard if you tried. It is incapable of controlling itself reliably, so there is no point in using MIDI to share that misfortune with other synths. There were two revisions of the Pro-One keyboard mechanism. There was one that was horribly unreliable and there was another one that was worse. Question 90: I have an OB-1 and an ARP Axxe that I would love to retrofit. Would the MIDIJACK work? Answer: Yes, the Original MIDIJACK will work for both. Question 91: I went to order a MIDIJACK from your website but I didn't feel good about your online ordering system. I don't trust having my credit card number accessible on the internet. Can I pay by some other method? Please reply. Thanks. Answer: Yes, it is possible to mail a money order or check as stated on the ordering page, unless you are still on the gold standard, in which case you will need to update to contemporary currencies. Unfortunately, you will have to trust the government enough to use US dollars. Seriously, the Synhouse.com e-commerce facility is the most secure available today. Proprietary software is used to accept your card online with 40-bit encryption and the information is transferred offline with 128-bit encryption. The card number is held only in RAM, not on a network server, and is held by Synhouse offline and is never accessible online via Synhouse.com after that. This is interesting, because all the credit cards that you do not want to make accessible online are actually accessible online 24 hours a day already. The next time you receive a credit card statement, look at the extra printing on the bill that asks you to try reading your statement and paying your bill online at the website of the credit card company, such as Americanexpress.com or MBNAnetaccess.com. You can go there, sign up, log in, and manage your account online. Therefore, your credit card is already accessible via the internet, whether or not you approve of or choose to participate in the e-commerce revolution which has migrated a great portion of all worldwide commerce to the internet. Ask the FBI if hackers from Seattle to the Ukraine are trying to hack into banks and credit card companies every day. Once they tell you yes, you will realize that it is false security to add a few weeks' delay your MIDIJACK order by mailing a check or money order. E-commerce has become successful primarily because it is quick and convenient. Synhouse receives more than 99% of all sales revenue via the internet. Question 92: Hi. I have an old Wurlitzer Stage Piano that has awesome feel. I'll never find a controller I like as much as this Wurli. Would it be possible to use your MidiJack to make the Wurli into a MIDI master keyboard? Answer: The Original MIDIJACK is for analog monosynths only. It is both analog and monophonic, so it does not work for upright pianos, grand pianos, Rhodes pianos, Wurlitzer pianos, Hammond organs, string machines, or anything other than analog monosynths.